Install kitchen backsplashes in your home for a welcome pop of color, a visually appealing design and protection from splashes and spills. This design element keeps your kitchen tidy and appealing through long years of meal preparation and dishwashing. Adding a backsplash is a little project that adds great impact to the look and function of your kitchen. Request a free pre-measure from our professionals so the proportions are exactly right for the material you choose for your stone, marble or tile backsplash. Our showroom carries numerous different patterns and colors for your backsplashes. Whether you’re looking for a sleek and modern look, or a more rustic design, we are sure to have the right options for you. We always stay on top of the latest trends to continue delivering the best selections. It’s no wonder why clients from throughout the area come to us first for their marble and stone backsplashes. Start on your next home improvement project with the help of our design specialists. Easily the most popular backsplash material, tile resists water and stains so it is an ideal material to protect the wall behind your sink or stove, or even the length of space that is underneath your cabinets. As food is prepared here, splashes and spills are common occurrences. You won’t have to worry or fret about food and liquids ruining your walls. 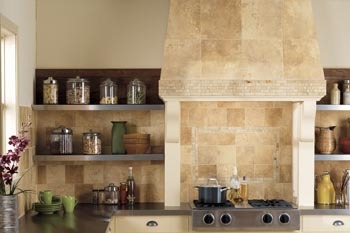 Just ask our professionals for backsplash installation to ensure the best results every time. Tile makes stunning backsplashes, especially when different colors and sizes of tile are used. We carry versatile options that ensure you can find the perfect choice to match your plans and designs. You and your guests are sure to love the bright patterns that tile backsplashes add. Your space is instantly upgraded after shopping for a backsplash with us. Let us help you create a beautiful design for a custom backsplash that makes you smile every time you walk into your kitchen. Do you have a favorite natural stone? This material may serve you well as a backsplash in your kitchen. After all, stone has a distinctive beauty that works well in any kitchen. It brings a timeless sense to your space that is sure to stay attractive for years to come. Stone backsplashes instantly add value to your home because of their longevity. Whether you’re looking to sell your house or just want it to look its best, our stone options are a perfect pick. Ask our design and sales professionals about the different materials we use for backsplashes and the merits of each. Our experts have comprehensive knowledge of our products, as well as extensive training in design. We can help you come up with a stone backsplash design that complements the décor of your kitchen and offers easy cleaning and maintenance. You can rest assured that your project is in great hands when you depend on us. With our great selection, we’re position that our backsplashes will transform your kitchen with a new backslash. Place the focus on elegance when you install a marble backsplash in your kitchen. The veins, the specks and the swirls make your backsplash unique and memorable. Let us help you choose the marble that works best with your décor. A backsplash is one of those design elements that can unify all the colors in your kitchen. We can create a custom backsplash that runs behind your sink and stove that offers protection and serves as a focal point. We understand that the kitchen is the most important room in the house. You spend so many hours there preparing meals throughout the day. That’s why we are dedicated to helping people make the most of their spaces. Throughout the community, people are looking for ways to spruce up their kitchens without breaking the bank. Our marble backsplashes always come at competitive prices. You can stay within budget and get a stunning space when you shop with us. Let our knowledgeable associates help you get a jump start on your next project. With so many options, it can be difficult to choose just one set of tile or marble. That’s why our showroom is staffed by knowledgeable and helpful specialists. We are available to help you plan out your kitchen backsplash to ensure that you get the most for your money. You’ll receive personalized assistance in designing and planning your project. No matter how extensive or straightforward your plans are, we are sure to have the right options. After picking your perfect backsplash, we’ll go over the installation process and what to expect. Installing a backsplash involves precision work in a small space. This is why we recommend that you choose professional assistance. Our knowledgeable specialists deliver top results each and every time. Ask us to send a team to your home to install a backsplash with skill and efficiency. With our service, you have a handsome new backsplash that provides beauty and protection in your kitchen for many years. All you have to do is relax when you leave the backsplash installation to the professionals. Contact us now for your free in-home estimate to install a kitchen backsplash. Our local business proudly serves residential and commercial customers in Baton Rouge, Prairieville, Galvez, White Castle, and Sunshine, Louisiana, including the surrounding areas.